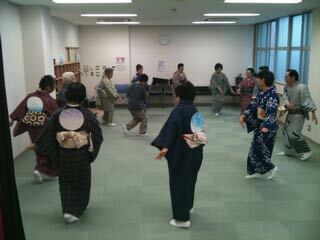 Goshugi Ondo(ご祝儀音頭) is one of Bon Odori Song. Dance is very simple and rhythmical. by Fuji Michiko, Suzuki Masao. Face to the direction (counterclockwise). Count 4. Cross forward right foot and scoop left side with right hand. Step back and bring the right hand up. Palm up. Step three from right foot to the center. Open arms. Step back from right foot. Make circle with arms. Clap, clap and clap and turn to right. Step three from right foot and make circle with arms. Do the same from left foot. Step right foot back and bring the both hands on lower right side. Swing your hands over the head and spin to the right (3 steps from right). Do the other side to finish spinning.